I came across this infographic and found that it leads to a fantastic resource that I must share with you. 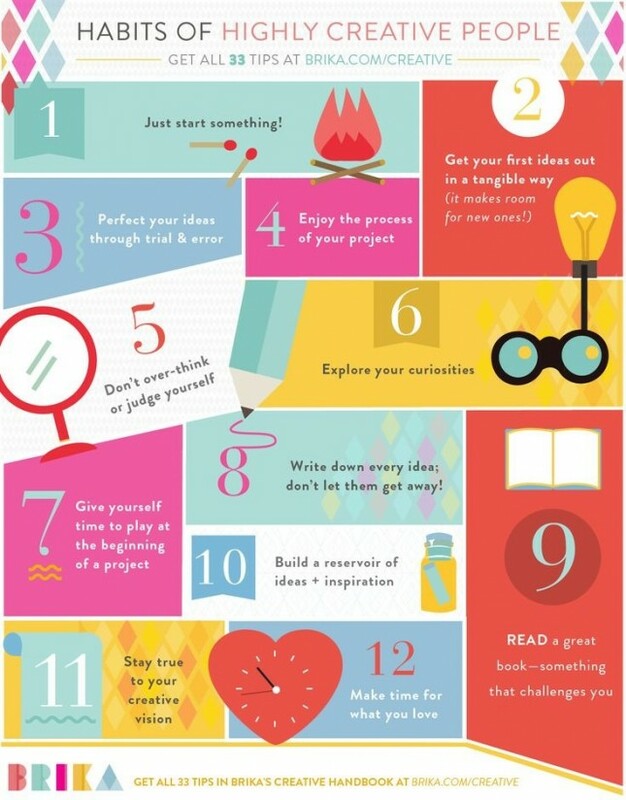 I’ve been exploring my own creativity for a while now and there are a lot of good tips here that I’m taking on board. Get your ideas out in a tangible way (it makes room for new ones). Perfect your ideas through trial and error. Enjoy the process of your project. Don’t over-think or judge your initial work. Make ‘creating’ a priority in your schedule. Give yourself time to play at the beginning of a project. Write down every idea; don’t let any get away. Read a great book – something that challenges you. Build a reservoir of ideas + inspiration either in digital or analog form. Make a plan and stay true to your creative vision. Give yourself hours – not minutes – to create. Walk away from a project, come back and make revisions. Ideally, travel to a foreign city. In a pinch, a good run or bike ride will do. Work on multiple projects at once to avoid getting hung up on one project. Keep experimenting; the best things come this way in art, work and life. Commit! Work on your craft every day – even if it’s only for 15 minutes. Find a theme you like and run with it. Then, edit it down to a few gems. People watch (everyone tells a story). Throw on some energizing music and take a dance break. Create a visual board of things that inspire you. Don’t succumb to fear (talent is 90% drive). Accept failure as part of the process. Relax and get out of your head. Bounce ideas off a trusted friend. Don’t get wrapped up in what other people are doing. Discover when and where you are most productive. Get off your computer and get out your paints, or pens, or whatever medium you love. Design and create for yourself, and everything else will fall into place. You can get detailed tips in Brika’s Creative Handbook. Great list–I love 1, 6, 9, 12, 20, and 21 the most. Thanks for the link to the handbook! Great reminder, Lately i have been struggling with Number 12. Lovely tips. So inspiring! Thanks for sharing! Glad you liked them, Parul. Download the e-book for more. Oh yes!! Love these and most are true for me. Creativity R Us!!! Glad you like them, Robyn. Do click on the link to get the e-book! I am confused. Is this something you wrote a reblog? No, I didn’t write this, Trenna. The link to the e-book is self-explantory. Everyone has a little bit of creativity in them, even if they don’t think so. I’ll be checking out the handbook. Thanks for the link. Oh we have a lot of creativity within that we don’t tap into, Karen!